Planet 7 Casino is an RTG-based online casino that offers new and established members numerous ways to increase their bankrolls throughout the week. Let’s take a closer look at all the fantastic promotions that Planet 7 is offering – including the $65 FREE CHIP no deposit bonus! 200% No Rules Bonus + 20 Free Spins LUCKYPATTY Min $50 deposit, slots only, no max withdrawal, sticky bonus None! Planet 7 Casino welcomes everyone to come and experience its online casino at no risk and without obligation via an $65 free chip. The only restriction is that you create a valid Planet 7 account and that this be your first account at the casino. During the sign-up process, simply use the bonus code 65NDB. This free chip is good for slots, keno, scratchcards, and bingo. Prior to making a withdrawal, there’s a 30x rollover require for slots and 60x for table games. This is the best Planet 7 no deposit bonus code, but Planet 7 does have other ones. However, you cannot redeem a no deposit bonus code back-to-back. You must make a deposit in between redeeming no deposit bonuses. So that’s when you would want to use one of the deposit bonus codes such as CASINO400 described below. Planet 7 Casino has a standard 100-percent welcome bonus, but the casino is currently offering a promotion that quadruples that amount. You must be a new member creating an account for the first time, and you must deposit at least $30. Do that and use the coupon code CASINO400 during the deposit process and Planet 7 will match your deposit amount by 400 percent. That means that if you deposit the minimum $30, you’ll start out at Planet 7 with an impressive $150 bankroll. This bonus is non-cashable, which means that it will be deducted when you make a withdrawal. 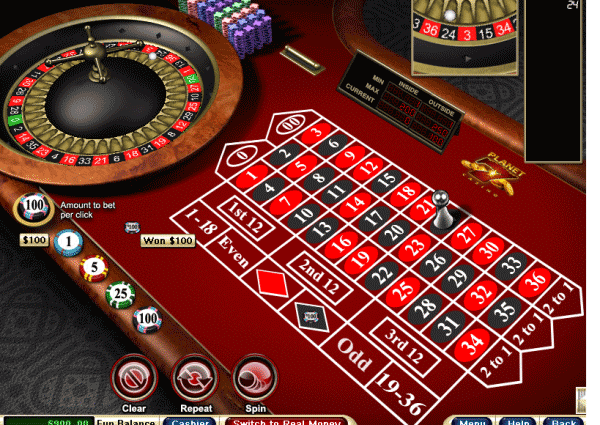 Furthermore, it has the standard rollover requirement of 30x for slots and 60x for table games. The normal deposit bonus that Planet 7 offers matches your deposit bonus by 100 percent. This isn’t just a welcome bonus but a bonus that every member can claim as often as they like. This bonus is also relatively restriction-free. The wagering requirements described at the end of this review apply, but there is, for instance, no minimum deposit requirement (outside of any minimum associated with the specific payment option you choose). If you’re a slots and casino fan first and foremost, then we have some great news for you: Planet 7 Casino offers a version of the standard deposit bonus designed specifically for you. Taking this option does limit your game selection to just slot and keno games, but it also increases your match bonus to 200 percent. That means that if you deposit $100, you’ll get a $200 bonus rather than just $100. Planet 7 Casino hosts a VIP program that’s open to all members. It features seven VIP levels, and your rank is determined by the total deposits you’ve made since joining. Once you’ve deposited $1,000, you’ll achieve Level 1 and begin earning one comp point per $10 wagered. Other benefits at Level 1 include free match play up to $1,000 each month and access to exclusive bonuses and promotions. As you rise in rank, you’ll accrue comp points at a faster rate, earn additional free match play, get casino insurance and receive special gifts and more lucrative promotional offers. A standard VIP bonus that Planet 7 offers is a 300-percent slots and keno bonus. Not only is that a considerably higher match than the standard offer of 200 percent, but the wagering requirement is only 15x rather than 30x. Crazy Days is a series of promotions that features a unique option for each day of the week. Monday is Happy Hour, which adds 50 percent to any bonus. Tuesday is Twofer, which gives you a 250-percent No Rules Bonus and 100-percent insurance to boot. Wednesday is Triple Threat, which awards a $100 free chip to anyone who makes a deposit on Monday, Tuesday or Wednesday. Thursday is Thriller and provides a 320 percent bonus on each $50 you deposit. Friday is Freebie time, where each $50 deposit gives you a free entry toward a $5,000 pot. Spin-O-Rama happens on Saturday, and lets you claim 50 free spins in addition to a 290-percent No Rules Bonus. Finally, there’s Sunday with a Cherry on Top, which awards you up to $125 in free chips depending on how much you’ve deposited that week. The standard rollover requirement is 30x for slots and some other games, such as keno, and 60x for table games and video poker. If you were to deposit $30 to claim the $120 promotional welcome bonus, you would have to wager $4,500 playing slots to clear the bonus and make a withdrawal. If you were to play blackjack instead, the amount would be $9,000. Of course, you can go back and forth between game types, and the contributions will be counted at the time each wager is made. 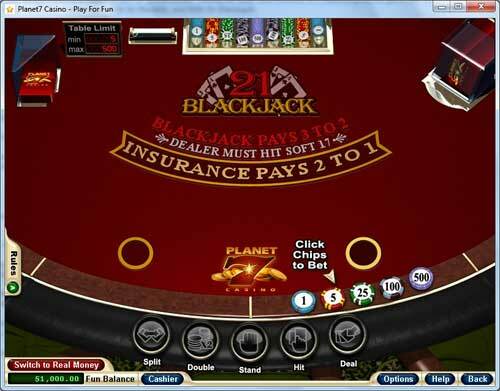 Note that bonus money can never be used on games with progressive jackpots, so you must have deposited cash in your account in order to play these games. Furthermore, certain games don’t contribute to wagering requirements: Baccarat, Craps, Roulette, Pai Gow Poker, Sic Bo and War. In addition, if a restricted game is played while a bonus is still active, Planet 7 reserves the right to void the bonus, winnings and the account itself. There’s also the matter of cashable and non-cashable bonuses and max cash-out. If you’ve met the wagering requirements for a bonus, you can make a withdrawal minus the bonus amount if the bonus is non-cashable and up to the cash-out limit. 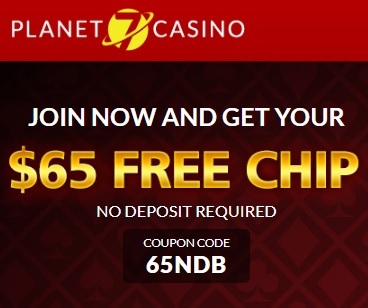 Get your $65 no deposit bonus from Planet 7 today! Find additional Planet 7 bonus codes here. Very fun and free. 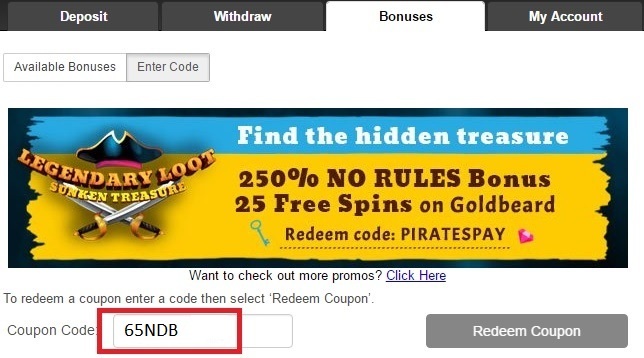 This casino offers free bonus codes. And the opportunity to cash out real money. I received the $85 free chip! No, you can't just turn around and withdraw it haha! But you can play it on slots and test out the casino. I liked Planet 7, I like how they honored the $85 free chip and I had a chance (even tho very tiny) of winning money w/ my free chip. I still play here and think it's about as legit as a casino can be (the odds are ALWAYS stacked against you but I like playing!). I think definitely worth trying out for free and then maybe make a deposit (I did).